Water / EOR Injection Profiles for Channels or Leaks using Distributed Sensing | Silixa Ltd. Periodic water/EOR injection profiles can detect channels or leaks and lead to the development of remediation strategies to maximise sweep through the reservoir. Silixa’s ArrayLog™ services utilise distributed acoustic (iDAS™) and distributed temperature (ULTIMA™ DTS) data to give injection profiles across the entire wellbore. The iDAS and ULTIMA DTS can be deployed periodically to log injection profilesor monitor well stimulation operations by running a fibre optic log as either a slickline, cable or coil tubing intervention. The optical fibre behaves as a sensor array making it possible to log the entire well path continuously without the need to move the cable and so providing information about dynamic flowing conditions in a way in which conventional sensors cannot. Distributed temperature data has been used in determining injection profiles through warm-back analysis for many years however injection is required to be suspended to observe the warm back and its ability to generate accurate profiles in horizontal wells is limited. The addition of phase-coherent distributed acoustic data (iDAS™) together with advanced acoustic processing allows injection profiles to be created during injection. Silixa leads the way in its unique combined approach that employs both temperature and acoustic data to create injection profiles or monitor well stimulation. 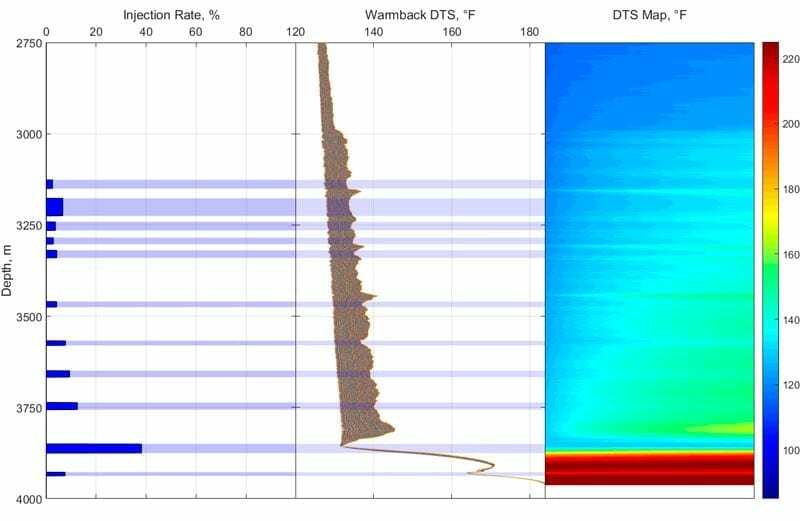 Our proprietary computational models are able to create injection or stimulation profiles by measuring the acoustic response of the wellbore. An accurate illustration of the temperature response of flow along a wellbore.